SAYL won the 'Best Workplace Seating' category at the FX International Interior Design Awards, held at the Grosvenor House Hotel in London on Tuesday 29th November 2011. 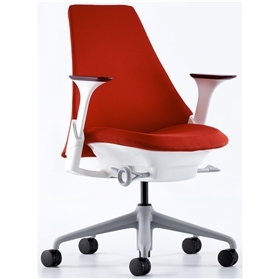 The 'iMac' of office chairs! Good design and comfort should be available to everyone, everywhere, its human nature to seek life unframed to go beyond expectations. 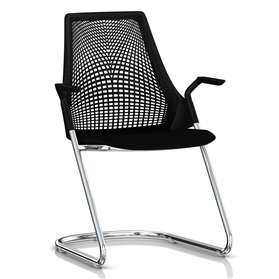 SAYL, designed by Yves Béhar, reflects this unframed spirit giving you a family of chairs which are as affordable as they are inventive. At the heart of SAYL is the first full suspension back that is literally frameless. It has no hard edges. 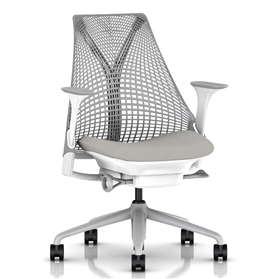 Freed from a rigid exterior frame, the back suspends giving freedom of movement and support, while the back materials keep you cool. 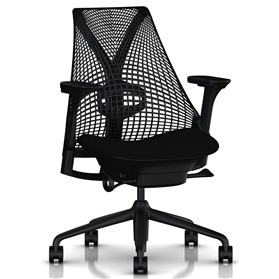 Fully adjustable arms with black armpads Tilt limiter with forward tilt Adjustable lumbar Seat depth adjustment as standard Black base and frame and black seat Designer - Yves Behar Manufacturer - Herman Miller (USA) Guarantee - 12 Years 24/7 use Assembled - Yes Our Opinion: Outstanding Herman MIller design at an affordable price! A must have. Xtreme Havana Black fabric seat.